A healthy breakfast, snack, or dessert, this Slow Cooker Baked Apples recipe is stuffed with raisins, pecans, and spices -- all drizzled in a warm, brown sugar cinnamon syrup! A healthy breakfast, snack, or dessert, this Slow Cooker Baked Apples recipe is stuffed with raisins, pecans, and spices — all drizzled in a warm, brown sugar cinnamon syrup! Serve with a dollop of vanilla yogurt, whipped cream, or vanilla ice cream for an added treat! 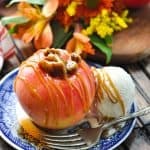 Stuffed baked apples are a traditional fall dessert, but I wanted to create a recipe that I could feel good about serving my family at any time of day. With fruit, healthy fat, and warm spices, these apples fit the bill. 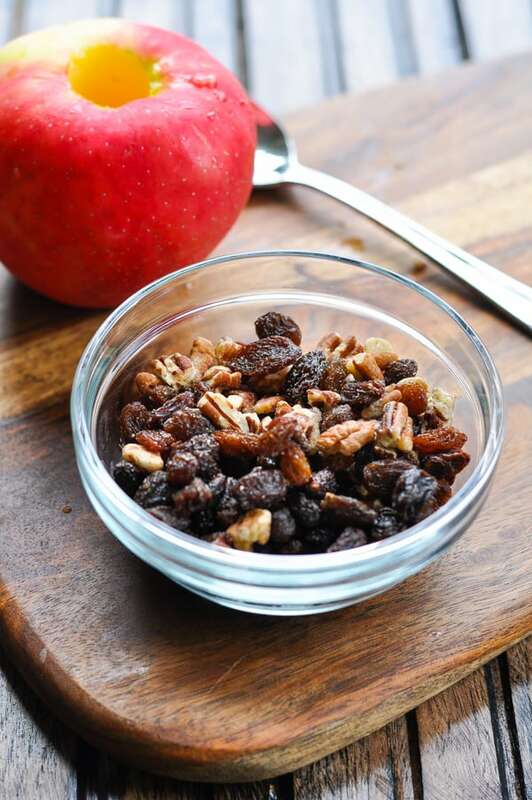 The plump and juicy raisins combine with the nuts and caramelized syrup for a decadent-tasting dish that works for a cozy Saturday morning breakfast, for an easy after school snack, or for a make ahead dessert when entertaining friends and family. 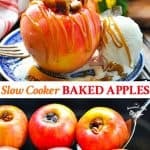 The slow cooker is the KEY to this easy baked apples recipe! I love that I can prep everything in advance and let the Crock Pot do the work while I go about my day. Plus, you can’t beat the warm aroma as the cinnamon, apples, and nutmeg waft through your kitchen. First, you’ll need to core 6 large apples. You can do this with a sharp paring knife, or you can use a handy apple corer like this. I use the corer for Southern Fried Apples, or for slicing fresh “apple donuts” for the kids as well. While it’s not necessary, the tool makes this task so quick and easy…I can get the 6 apples done in about 30 seconds! Love it. The best apples for baking are those that include a nice balance of sweet and tart flavor, with a firm flesh that holds up well to the heat. You don’t want a big pile of mush at the end of baking, since we’re not making applesauce here! Next, toss together the raisins and chopped pecans. Use a spoon to stuff the nut mixture into the center of each apple. 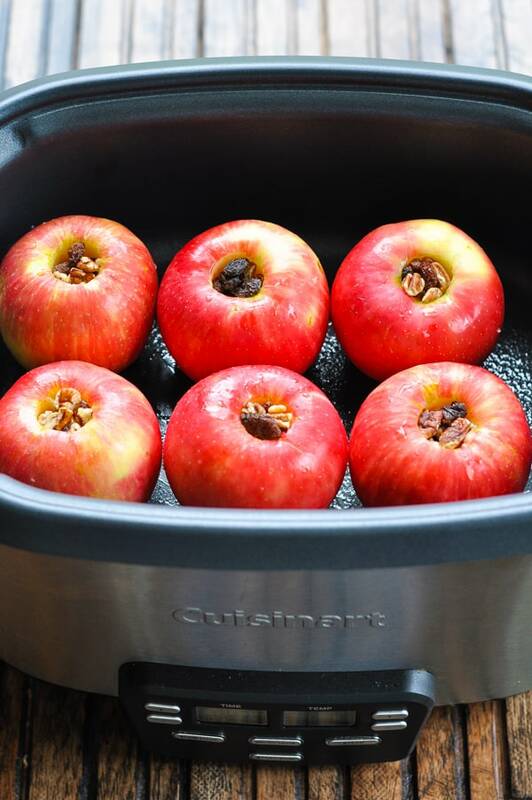 Place the stuffed apples in a 5- or 6-quart slow cooker that has been sprayed with cooking spray. Then it’s time for the sauce! You’re going to make a simple brown sugar-cinnamon syrup to pour over the apples. 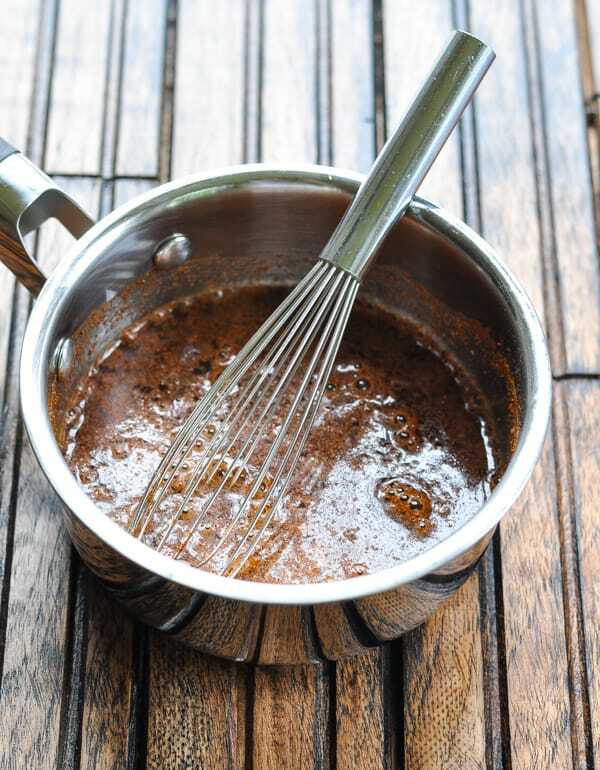 Combine brown sugar, water, salt and spices in a saucepan and boil for 5 minutes. The syrup will thicken and you’ll know it ready! How long do baked apples take to cook? Pour the cinnamon syrup over the apples, cover, and cook on LOW for 2-4 hours or on HIGH for 1 1/2 – 2 hours. Use the lower end of the cooking times if you like a firmer baked apple (like those shown in these images), or cook the apples longer if you want them softer. Also, remember that different makes and models of slow cookers cook the food at slightly different temperatures, so the final cooking times will always vary. Use an apple corer to remove the core from all 6 apples in about 30 seconds! If you don’t have this tool, try a sharp paring knife. Try using chopped walnuts, peanuts, or almonds instead of the pecans. 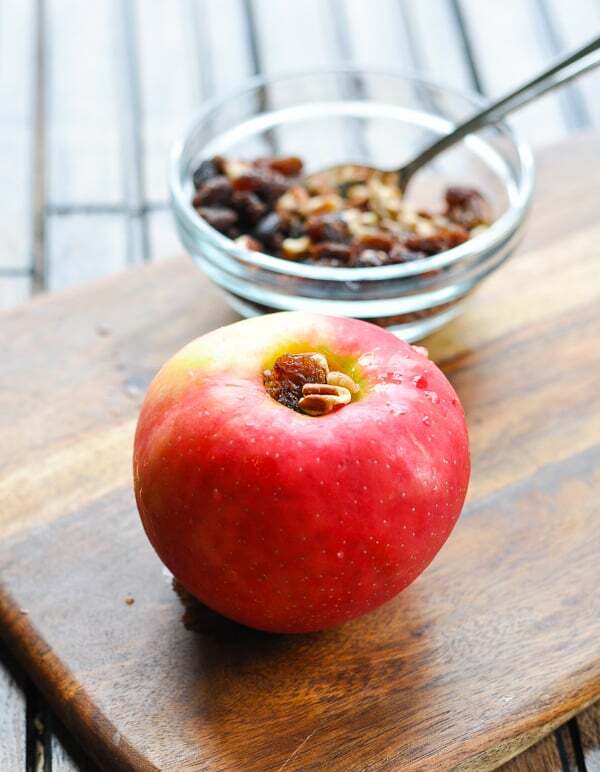 Add oats to the nut and raisin mixture to make these baked apples with oatmeal! Have leftovers? I like to make a batch of baked apples over the weekend, and then store the apples in individual containers in my refrigerator. During the week, I can easily reheat the apples in the microwave in about 2 minutes and enjoy them for quick breakfasts, snacks, or desserts! For breakfast, make the baked apples healthy by adding a serving of protein in the form of Greek yogurt on top! You can also garnish with additional chopped nuts or granola for some crunch. 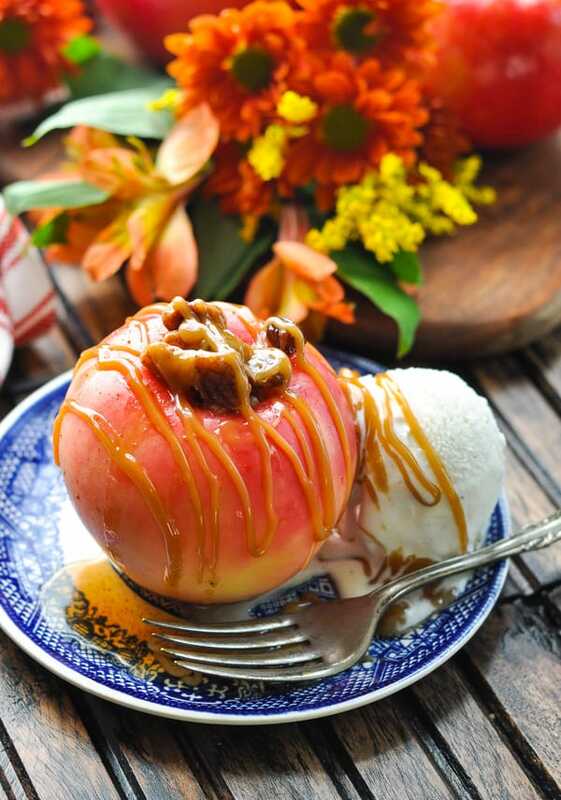 Nothing beats the combination of baked apples with oatmeal! You can prepare a batch of oatmeal to serve alongside your apple, you can chop up your baked apples and mix them into a pot of oatmeal, or you can add oats right into the raisin-pecan mixture for stuffing. 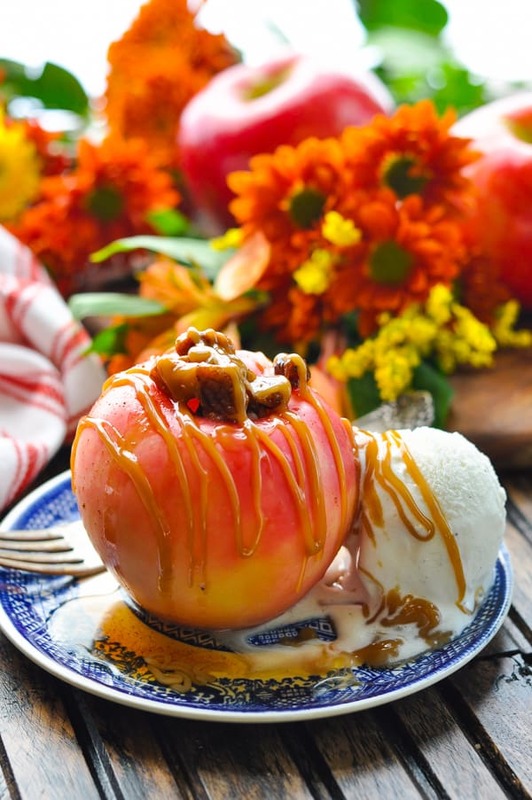 For dessert, try serving the baked apples with a scoop of vanilla ice cream or a dollop of whipped cream. I love to add a drizzle of caramel sauce on top, too! 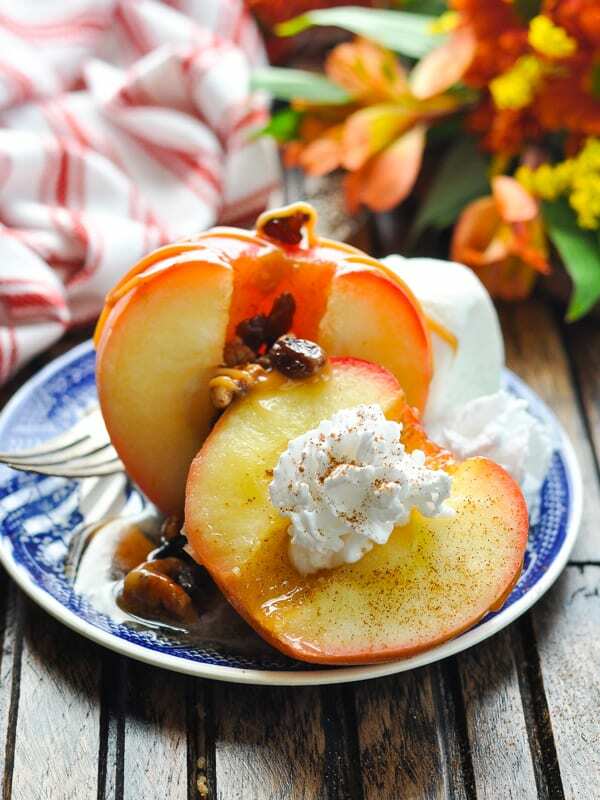 I hope that you love this cozy autumn treat just as much as we do! In a small bowl, combine raisins and nuts. Fill centers of apples with nut mixture. Since there is a hollow center in the apples, I find that it's easiest to hold the apple in the palm of one hand (blocking the bottom opening) and use a spoon to push the oats into the top of the apple. Then just slide the apple from the palm of your hand directly into the slow cooker -- nothing will fall out the bottom! 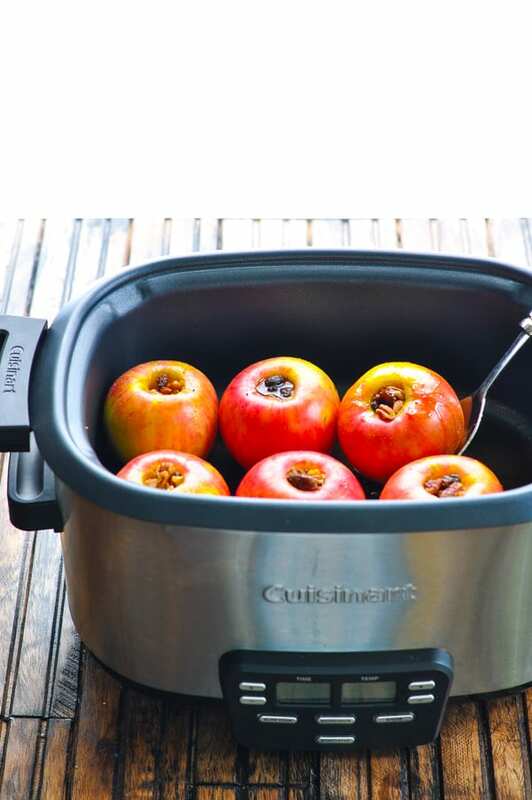 Place apples in 5- to 6-quart slow cooker. Next, combine the brown sugar, water, salt, cinnamon and nutmeg in a small saucepan. Heat and boil for about 5 minutes, whisking regularly, until syrup thickens. 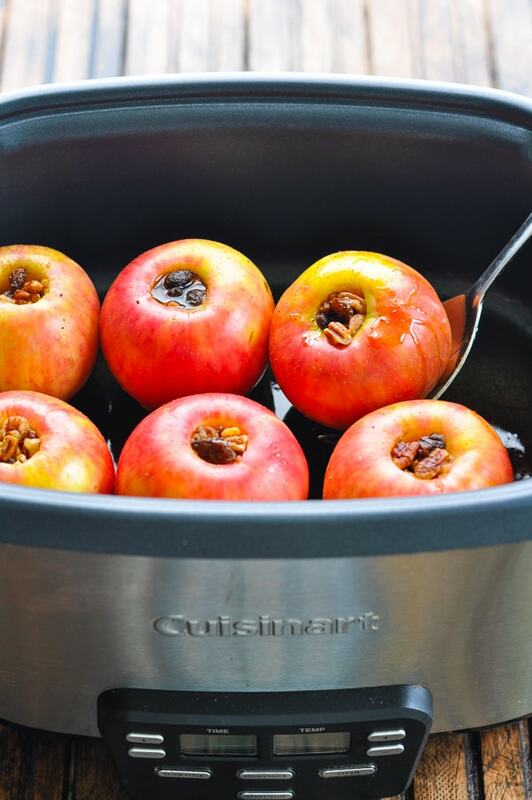 Pour syrup over apples in the slow cooker. Cover and cook on LOW for 2-4 hours or on HIGH for 1 ½ - 2 hours (or until apples reach desired softness). To serve, place apples on plates or in bowls. Spoon syrup over apples. Garnish with optional toppings. 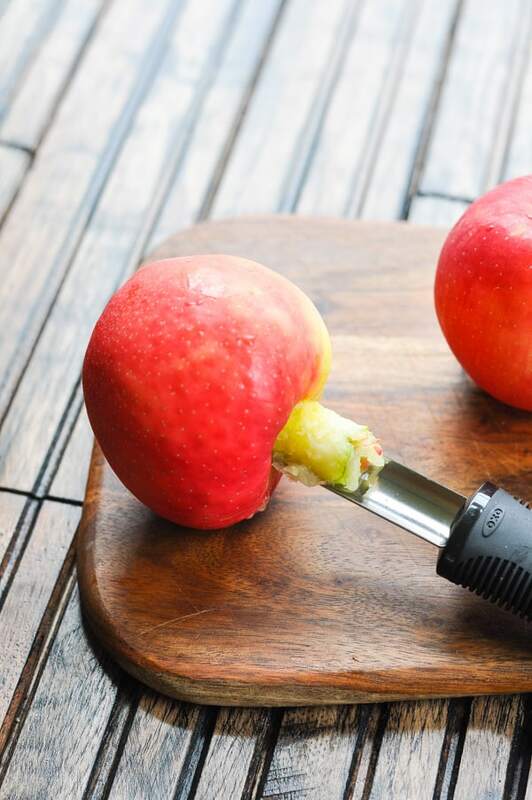 Use an apple corer to remove the core from all 6 apples in about 30 seconds! If you don't have this tool, try a sharp paring knife. This post was originally published in August, 2014. It was updated in October, 2018. Yum! These apples must smell so good while they are cooking. I love the granola-like centers. 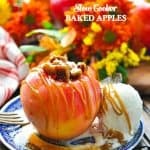 I’m pinning and putting these on our fall menus! Thanks for sharing. I’ve made oatmeal-stuffed apples a couple of times, but I’ve never tried them in the slow cooker before. Pinning and can’t wait to give them a go! I can just imagine how these would smell cooking! I currently live in Hawaii and it’s beautiful here, but I miss the East Coast and changing seasons. I need to make these – they will remind me of fall. Blair, these will be perfect for fall, and how about right now, yes! Hope you are having a great Labor Day Weekend and thanks so much for sharing your awesome recipe with Full Plate Thursday.